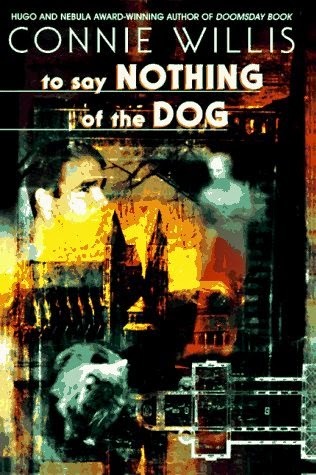 This last Monday the Chicago Nerd Social Club met to discuss "To Say Nothing of the Dog" (1997), a comedic time travel story (and Hugo Winner) by Connie Willis. While the novel takes place within a fictional universe Willis has created, centered around time travel, with significant chunks of it touching on World War II, "To Say Nothing of the Dog" can very much be read as a stand-alone novel. Our protagonist and narrator, Ned Henry, is a time traveller from the mid 21st century, part of a seemingly-trivial project to restore a cathedral in Coventry that was destroyed during the Blitz. The time travel here does not appear to allow bringing "significant" objects forward in time, nor the alteration of history in major ways--though as the novel progresses, it becomes clear that there's quite a bit of plasticity in the timelines as long as they agree at certain points. Right as the novel begins, Ned is sent back to Victorian England as the only place he can hide from his rampaging boss/patron, the Lady Schrapnell, for some much-needed rest (excessive time travel causing a number of odd symptoms best categorized under "loopiness"), where he discovers that a fellow time traveller may have unintentionally started a break in the time continuum by saving a cat from drowning. The rest of the novel is a madcap dash, mostly in the company of a small cast of Victorian characters, as Ned and other time travellers try to fix the errors they've introduced, only to realize that those fixes have introduced more. The novel riffs heavily on Jerome K. Jerome's "Three Men in a Boat" (1889), the subtitle of which is this novel's name, a comedic travelogue along the Thames. It also draws on murder mysteries in the vein of Agatha Christie, especially her detective Hercule Poirot, while its humorous style reminded me strongly of her play "The Mousetrap" (1952). Additionally, there are direct references to and mimesis of Dorothy Sayer's "Lord Peter Wimsey" stories (highly recommended by club attendees familiar with the series), and some comparisons to P.D. James' work as well. While it doesn't require familiarity with any of the above--or with Tennyson, Shakespeare, and other referenced works--it's definitely the richer for at least some awareness of them. It took me a while to click to the comedic style here, but once I did I really enjoyed it. It's very dialogue-heavy, very British, with just a tinch of slapdash, lots of self-referentiality (setting up repeating gags, for instance), and a lot of the humor arising from various characters being fairly crazy, or at least having very irrational goals and projects that they are nonetheless committed to. Much like "The Mousetrap", with others at group comparing it to "screwball" films of the 1940s--I thought of Frank Capra's 1954 film adaptation of Joseph Kesselring's play "Arsenic and Old Lace" (1941), although that actually feels a little slow-paced compared to this. It's "interrupty" comedy, with a number of fairly straightforward plots or ideas constantly shoved aside by people, circumstances, or Sudden Travel to Other Times. A really good point that we talked about for a bit is how the comedic nature of a work can enhance the suspension of disbelief. When humor is well-executed, we're more forgiving, more willing to accept plot points that might seem jarringly unrealistic in a more straitlaced book. Thinking particularly of Douglas Adams and Terry Pratchett--though it's a bit sad this week, with Pratchett just passing away. Throughout the novel, a bit of humor that constantly struck me, over and above the hijinks on the page, was the fact that the entire time-space continuum of the universe is in danger from breaking, not because of nefarious villains or hubristic science gone too far, but because of an overzealous rich hobbyist needing to get her restoration project just right. An interested complicated bit that we discussed is how exactly "the continuum" works. We're told that only "significant" deviations from the timeline are problematic, with small amounts of inanimate matter being considered "insignificant" if they are messed-about-with. While it makes sense as a narrative device, this is pretty anthrocentric; weirder and more interesting still is the extent to which the continuum is personified as actually having intentions and plans, engineering complicated fixes by adjusting when and where people are allowed to time travel (from and to). Two ideas that the novel consciously plays with that I really appreciated: Professors Overforce &amp; Peddick's debate over a "natural forces" vs. "character-based" theory of human history, and the history of elaborate intelligence and counter-intelligence in WWII, specifically the Ultra project and the (mythical) sacrifice of Coventry. The time travellers' confusion and concern over what events and people are vital to the timeline parallels the "impersonal forces vs. individual agents" argument (hinting at a Grand Unified Theory of sorts, and bringing Hari Seldon to mind), while the continuum's "intelligence" is specifically compared to the kind of activities undertaken by the British WWII intelligence agencies--elaborate layers of deception and misdirection to cover up what's really known or not. Time travel issues and Victorian sexism brought to mind Gibson's "The Peripheral" and Brennan's "A Natural History of Dragons", respectively, both recently discussed by the Chicago Nerds; the mechanism of being "allowed" to save works of art by time-travelling them away right at the moment of their destruction is the same mechanism used in Jo Walton's new novel, "The Just City" (2015). A good read, and the most enjoyable Willis I think I've read to date. Not reported here, by the way, is our extensive discussion of dogs and cats--although I will say that someone referenced the way that dog breeds have significantly changed in fairly recent history. Next month's CNSC selection, which I don't think any of us have read yet, is V.E. Schwabs' "A Darker Shade of Magic" (2015). We're also thinking of giving Dan Simmons' "Hyperion" (1989) some sort of award for being a perennial candidate without ever being selected. The Nader award, perhaps? Although I lean more to Eugene V. Debs, myself.